We drove up to Alexandria today for cousin Desiree’s birthday party. Juliette had so much fun in the playground and in the pool and with the hose toy. Thought you might like to see the videos I took with my iPhone at the party. 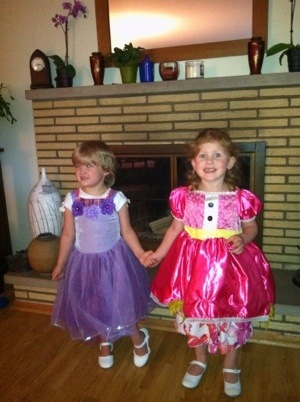 They got their fancy dresses on and had a great tea party Thursday night with the new china tea set Granny Bama sent. The only thing missing was cousin Desi. 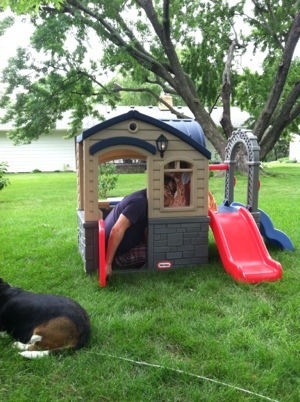 She had a blast playing in her new play house with Uncle Johnny when he and Auntie Di came over this morning. Guess who got wings today? Yes, she did – and leis and flower “hair bows” and a magic wand – and after she turned me into a frog, she took a picture of me and told me I looked like a troll under the bridge. Isn’t that nice? 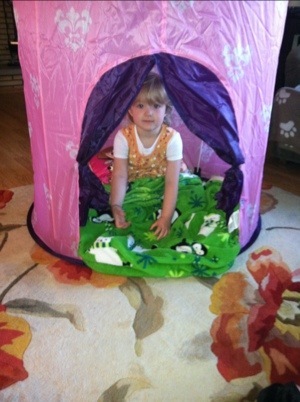 She also told I was “the best papa ever” at our nap, so I guess it all balances out in the end, right?